Migrantas has been working on projects related to migration, identity and dialogue between different cultures. Their projects combine tools from the social sciences, graphic design and the visual arts to create a reflection of the migrant condition. Mobility, migration and transculturality are not exceptional any longer. On the contrary, they are becoming a very central phenomenon of our times. The thoughts and emotions of the immigrants though remain invisible to the greater part of society. Through their projects Migrantas aims to offer a means of making visible in the urban space the feelings and reflections of those who are now living in a new country. The members of Migrantas have themselves emigrated from Buenos Aires to Berlin. They conceive of their work with other migrants as a horizontal dialogue. 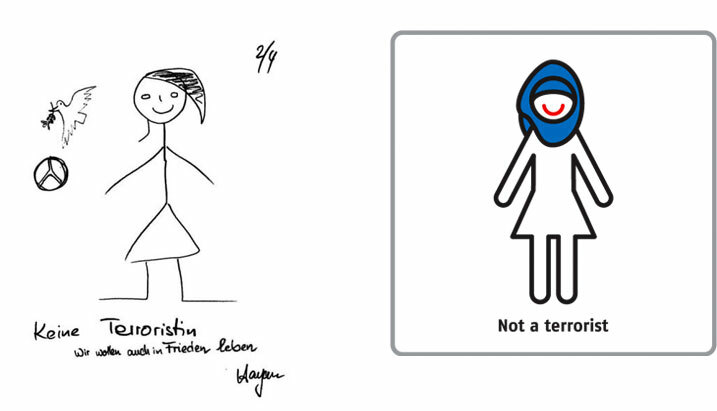 Taking drawings produced during the workshops as a starting point, Migrantas develops a series of pictograms. All of them relate visually and conceptually to the ideas expressed by the participants. The complete drawings are carefully analyzed in order to identify key elements and common subjects. For example, the feeling of having a multiple cultural identity, the sadness of having the heart divided in two by distance and worries about children’s futures are all questions affecting migrants of very different backgrounds. The pictograms aim to offer a graphic summary of these ideas while respecting the character of the original drawing. The visual communication of Migrantas is based on pictograms. These basic pictures combine a high potential for expression with a great power of synthesis. Simple designs allow the transmission of a broad range of emotions. The message is both anonymous and personal, so that people from very different backgrounds can identify with them. At the same time, their universal character makes their comprehension easy beyond cultural codes. Pictograms are the visual language of a global world. 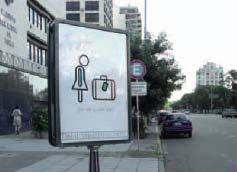 More on the project and more pictograms you can find on www.migrantas.org.